« The tree of life should be a garden. With bushes. Ian Mackay of Virology Down Under fame (or notoriety B-) today alerted me to a new paper on the evolution of viruses – which is being touted via press releases as being something that “…adds to evidence that viruses are alive”. To my mind at least, it does nothing of the sort: what it does do is provide evidence via the medium of comparison of protein folds that “…implies the existence of ancient cellular lineages common to both cells and viruses before the appearance of the “last universal cellular ancestor” that gave rise to modern cells”. Arshan Nasir and Gustavo Caetano-Anollés took advantage of the fact that protein structure is at least 3 to 10 times more conserved than sequence, and analysed all of the known folds in 5080 organisms, including 3460 viruses. They identified 442 protein folds shared between cells and viruses, and 66 that are unique to viruses – indicating that virus proteomes truly are more diverse than cellular proteomes. “Some giant viruses also have genes for proteins that are essential to translation, the process by which cells read gene sequences to build proteins, Caetano-Anollés said. The lack of translational machinery in viruses was once cited as a justification for classifying them as nonliving, he said. Well, some of us have thought a lot more of viruses for a lot longer, obviously! 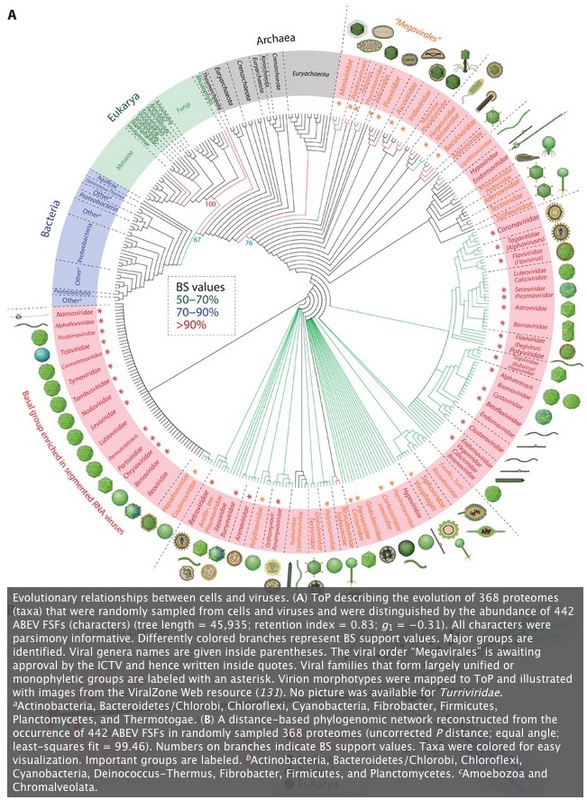 I have taught for years, for example, that viruses are alive – and just last week this blog has a post on how “The” Tree of Life should in fact be a garden, with a tree and a whole lot of bushes. This entry was posted on 28 September, 2015 at 11:16 and is filed under Evolution, General, General Virology, history, Viruses. You can follow any responses to this entry through the RSS 2.0 feed. You can leave a response, or trackback from your own site.